We’d love your help. Let us know what’s wrong with this preview of British Generalship on the Western Front 1914-1918 by Simon Robbins. This book explores the British Army's response on the Western Front to a period of seminal change in warfare. 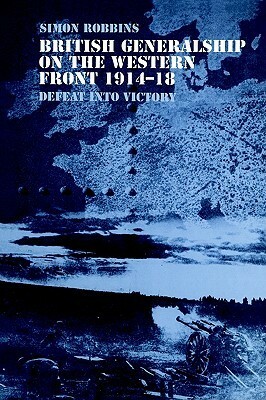 In particular it examines the impact of the pre-war emphasis on worldwide garrison, occupation and policing duties for the Empire's defence of the mindset of the Army's leadership and its lack of preparation for a continental war involving a massive, unplanned incr This book explores the British Army's response on the Western Front to a period of seminal change in warfare. In particular it examines the impact of the pre-war emphasis on worldwide garrison, occupation and policing duties for the Empire's defence of the mindset of the Army's leadership and its lack of preparation for a continental war involving a massive, unplanned increase in men and material. The reasons for the poor performance in the early years of the war, notably professionalism within the British Army, including poor staff work, 'trade unionism', careerism within the high command, and the tendency of an overconfident hierarchy to ignore the need for reform to tackle the tactical stalemate prior to 1916, are analyzed. The high command rapidly learnt from the defeats of 1915-16 and performed much better in 1916-18, an especially formative period resulting in the promotion of a younger, more professional leadership and the development of the first truly modern system of tactics which has dominated wars ever since. To ask other readers questions about British Generalship on the Western Front 1914-1918, please sign up.